For a long time WTRX (trix) was the equal (or better) than WTAC. 1330 I believe. Played more local and cutting edge stuff.......then they faded. Another DJ was Mike Gaylord. 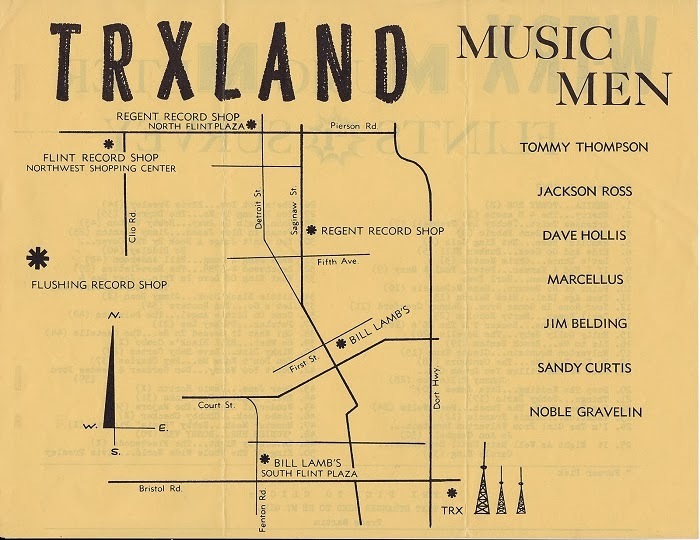 This is just a small snapshot of WTRX in 1962. There were scores of others over the years. Mike Gaylord is still around. He owned the station in Ashley, WJSZ, for a while, known as The Castle, after Curwood Castle. There are at least six sometime Flint DJs and other radio people who have written autobiographies. Still others have written books outside the radio theme. WTRX became an Adult Contemporary station in early 1968. After a short time as Z-Rock as WDLZ in 1989-1990, WTRX returned with a Sports format, which it has had since 1994. Marcellus in the Morning! Help Hollis with the Homework! Z-Rock!! I loved that station.. it was a nice break with wwck going to soft rock/dance garbage! Z-Rock was canned syndicated BS broadcast from elsewhere- not a legit Flint station. Z-Rock thrived on the surplus of lousy AAA hair metal junk: Danger Danger, D.A.D., Salty Dog, Bullet Boys, Sea Hags, Trixter, Enuff Z'nuff, Dangerous Toys, Tot Tora, Sleaze Beez ... need I say more. Garbage Rock. WDLZ Z-Rock did have a live local morning show, at least for a while. They were familiar names, like maybe they were in that Jim Baade video, having also worked for WWCK-FM. The owner, who owned David Lee Limousines and Yaklin Mobile Homes, mainly wanted the lot for displaying mobile homes. The late great "Sleepyhead" Ted Johnson, of WTAC, WFDF, and later Comcast Cable local program fame, was the General Manager. ...Don't forget Skid Row, Steelheart, LA Guns, White Lion, Dokken, Extreme, Malmsteen, Cinderella, Ugly kid Joe (etc) Hey when there is no other rock it was good enough for me. Nobody could top WWCK in the late 70's early 80's before they began that slow death to where they ended up. Now that is an UGG!